Our most technical race garment to date, this perforated cowhide leather suit is race ready at an affordable price. Building on our experience and feedback from elite AMA Pro Racing sponsored rider’s; protection, ergonomics, and performance have all been updated. 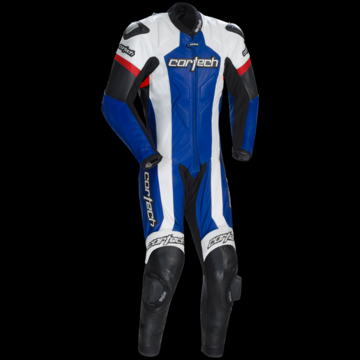 Featuring a seamless design in the legs, external armor featuring aluminum sliders in the shoulders and elbows and accordion stretch panels throughout the entire suit the Adrenaline Suit is exactly the value you have come to expect from the Cortech brand. • Constructed with perforated and non-perforated top grain drum dyed leather (1.2-1.4 mm). • Aerodynamic speed hump with perforated leather ventilation. • CE-Approved shoulder, elbow and knee protectors. • Triple and double-stitched with high strength, bonded nylon thread. • Heavy duty, 600 denier stretch Kevlar® panels in the arms, inseam, and calves for ease of movement. • Molded shoulder protectors with integrated ventilation intake vents. • Cuffs feature a spring-loaded zipper pull to eliminate flapping. • EVA foam padded collarbone protection panels. • Convenient inner chest pocket. • Cortech knee sliders and storage bag included.